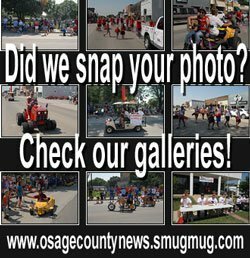 Huffman Park, in Osage City, will someday have a tree-lined, shaded walkway according to a plan to create an arboretum at the park. Osage City’s Huffman Park is well on its way to being the first public arboretum in the county, after the Osage Tree Board began planting trees on Oct. 18, in recognition of Arbor day and also honoring a former tree board member. The proposal to create the Huffman Park Memorial Tree Walk and Arboretum was in the works this summer, with the Osage City Council officially signing off on the tree planting program in September. Tree board chairman Cheryl Mussatto said the board has wanted to create a memorial tree walk and arboretum for years, and the city council’s approval of using Huffman Park with its eight-foot wide walking trail around the perimeter has made the plan a reality. “It is now time for the planting of trees that anyone in the public would like to donate,” Mussatto said, noting trees can be planted to memorialize a departed family member or friend, or to commemorate a special occasion. Part of the plan approved by the city council includes the tree board’s policy and guidelines for accepting donations for planting trees in Huffman Park. As planned, funding for planting trees will be provided by private donations by families or other entities, but maintenance of the park and trees will be by city crews or tree board members, including watering, pruning and removal of trees when necessary. In a presentation to the city council, the tree board said the park will not only serve as a place to memorialize or honor loved ones by planting a tree, but also to increase knowledge and appreciation of trees, and provide a shaded walkway for everyone. Provide an additional walking trail in the city to encourage physical fitness in a quiet setting. Carry out the mission of the tree board by educating citizens to promote a healthy urban forest, promoting the preservation of desirable trees to be planted in this area, increasing urban aesthetics, and providing supervision of planting, pruning, removal and maintenance of the trees planted in the public park. 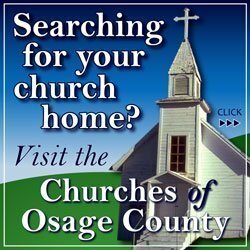 Provide Osage City residents and other users of the trail a user-friendly walking trail, where people can walk and learn about types of trees that will be identified by plaques. This increases knowledge of tree species, appreciation of trees and encourages people to plant more trees on their own. 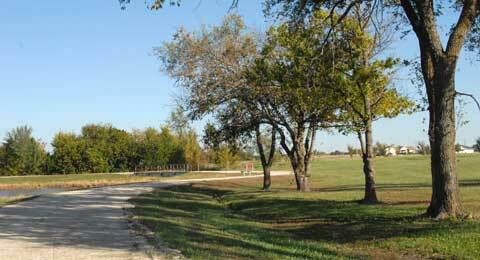 Provide a nearby walking trail for the residents of Osage Manor. Ann Lusk was present at the Osage City Arbor Day celebration during which trees were planted in Huffman Park in memory of her late husband, Harold Lusk. She is standing next to a newly planted Goldenrain tree. After the plan’s approval by the city council, The Osage City Tree Board celebrated Arbor Day on Oct. 18 at Huffman Park, by planting approximately 20 trees using former tree board member Harold Lusk’s memorial fund. The variety of trees planted included Goldenrain trees, Lacebark Elms, Bald Cypress and Redbuds. 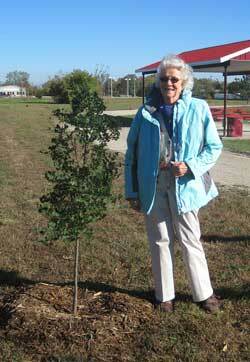 Harold’s wife, Ann Lusk, was present for the tree planting. In the future, a plaque will be placed next to some of these trees, stating the type of tree and that they were planted in memory of Harold Lusk, who was a dedicated member of the tree board and gave of his time and effort to be of service in planting trees throughout Osage City. Harold Lusk died in 2013 at the age of 89. “This project is an ongoing one that will be appreciated by future generations,” Mussatto said. 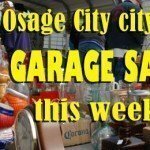 Anyone who wishes to make a donation or would like more information should contact Mussatto at 785-528-3015 or [email protected], or contact the Osage City Hall.